With its complexly interlinked characters (among them a ballerina exiled to Siberia and a Chechen war-veteran-turned-drug-dealer); recurring objects passed, like a series of batons, from tale to tale (an unplayable mixtape, a painting of a Chechen landscape); and near-century-long narrative arc (from the Stalin-era Soviet Union to Putin’s Russia) splayed against a backdrop of systemic corruption and personal futility, Anthony Marra’s new book presents as if it were the love child of David Mitchell and George Orwell. Powerless against the larger forces shaping their lives, Marra’s characters perform small, personal acts of subversion. Roman takes to painting the image of his brother—executed for his “religious radicalism”—into the same photos from which he expunges others. Decades later, a curator speculates about his motives while organizing an exhibit of his work. Tsar has been promoted as short-story collection, which strikes me as an odd bit of genric gerrymandering (though to what particular end, I’m not sure). 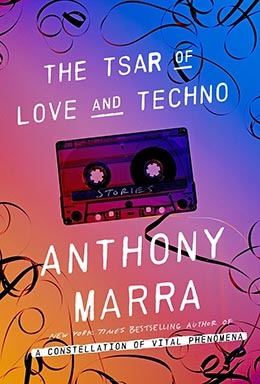 You can read these stories as standalones, but do so and you’ll miss out on Marra’s fiendishly clever narrative web and the true scope of his virtuosic achievement.